Conservation can sometimes seem like an amorphous, nebulous, unattainable goal. One school of thought believes the goal of conservationists is to restore abused land to primary forest. They argue this is the best and fastest way to see results. This may be fast on a per site basis, but land conversion can be slow and--especially if you&apos;re just a few people-- it’s hard to get it to catch on around the world. 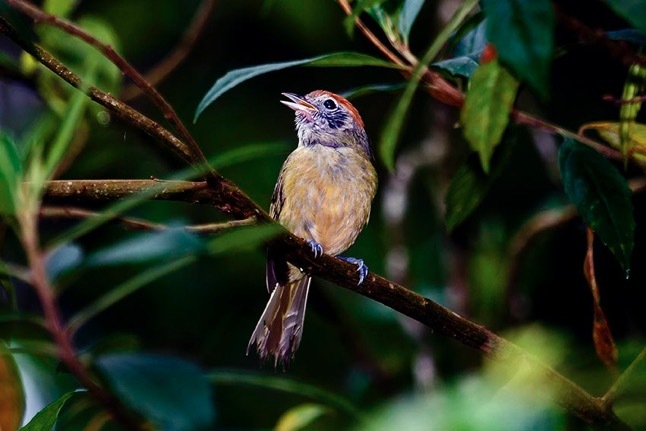 Another school of thought (spearheaded by Ivette Perfecto, John Vandermeer, and colleagues) believes that we need a grander paradigm shift if conservation is going to happen on a global scale. Instead of presenting human land use as essentially at odds with conservation (viewing conservation success as nature at its most pristine), these conservationists argue that humans can be part of nature if we change the way we use land. Specifically, we need to change agricultural practices on a large scale, and especially in the tropics, if we wish to conserve biodiversity. This latter school of thought is based on both theory and empirical research that show that rustic forms of agriculture, such as shade coffee and cabruca cacao, can actually maintain nearly equal levels of [animal] biodiversity compared with pristine forest. My first three dissertation chapters are focused on the intersection of landscape modification (habitat fragmentation) with disease susceptibility. 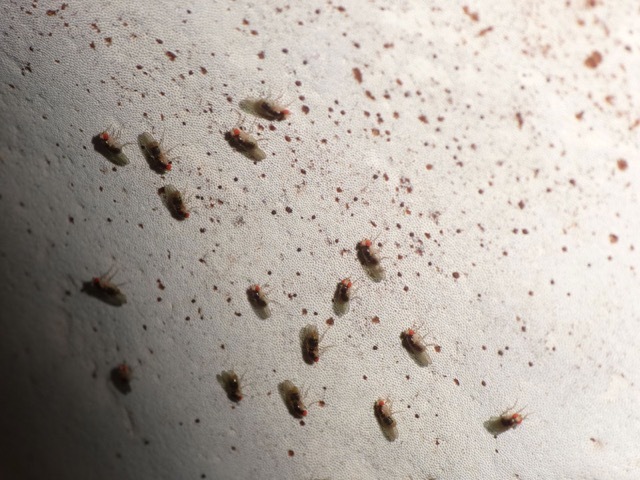 The underlying hypothesis that I am attempting to test is that as populations become fragmented, they become more susceptible to disease. After attending meetings of the New World Agriculture and Ecology Group (NWAEG) as well as a few joint lab meetings of the Perfecto and Vandermeer ("Perfectomeer") research groups at U. Michigan, I started to wonder about the true usability of this research in conservation. I became interested in not just looking at fragmentation as a binary variable (fragmented versus not), but in examining the effects on wildlife of different types of habitat modification (rustic landuse vs. intensive agriculture vs. pristine forest). So I decided to go to the epicenter of rustic farming and cacao capital of Brazil: Bahia. A cacao tree in Igrapiuna, Bahia, Brazil. Cacao flowers and fruits are borne on the trunk of the tree. On my first research trip to Brazil with the James Lab (January 2014), the first field site we visited was the Serra Bonita (“beautiful mountain”) reserve in Camacan, Bahia (“Bah-EE-yuh”). Serra Bonita was such a magical place - it is an incredibly biodiverse patch of high elevation forest, located on the top of a mountain in the middle of cacao country (Costa de Cacau). There were so many exotic hummingbirds, monkeys, insects, and of course frogs. Just outside of our doorstep at the high elevation field station was a misty tropical wonderland, waiting to be explored. This was the kind of tropical paradise I had always dreamed of visiting, and I always hoped to go back since that first year. The view of Camacan from the top of Serra Bonita. That hope became a reality when I returned to Bahia in January 2017 to collect samples from a variety of habitats to determine how landuse affects amphibian health and disease susceptibility. My first stop (after meeting new collaborators including Mirco Solé and Victor Dill at the State University of Santa Cruz in Ilhéus, Bahia) was Serra Bonita, but this time I and my field assistants stayed in the new low elevation research station, at the base of the mountain. The station was built between a patch of forest and a patch of cabruca cacao. Cabruca is a style of cacao farming in which the native canopy of tall, old trees is left intact, while the subcanopy is removed and replaced with cacao trees. 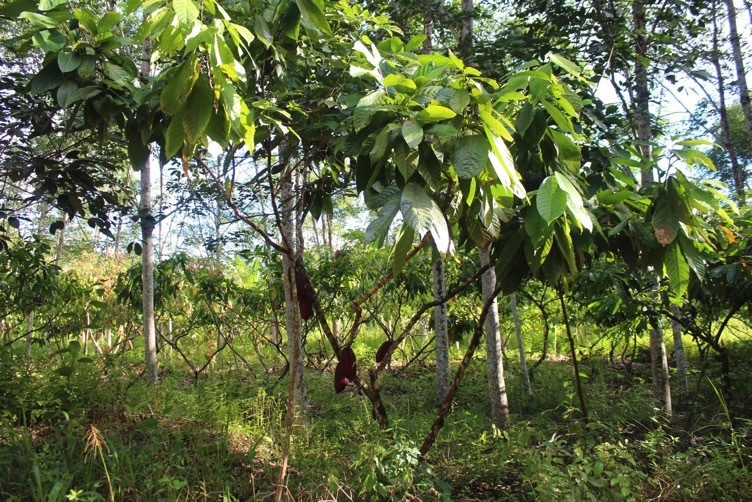 Because cacao evolved as an understory tree, cabruca farming is a way of producing cacao commercially but in a more natural setting. 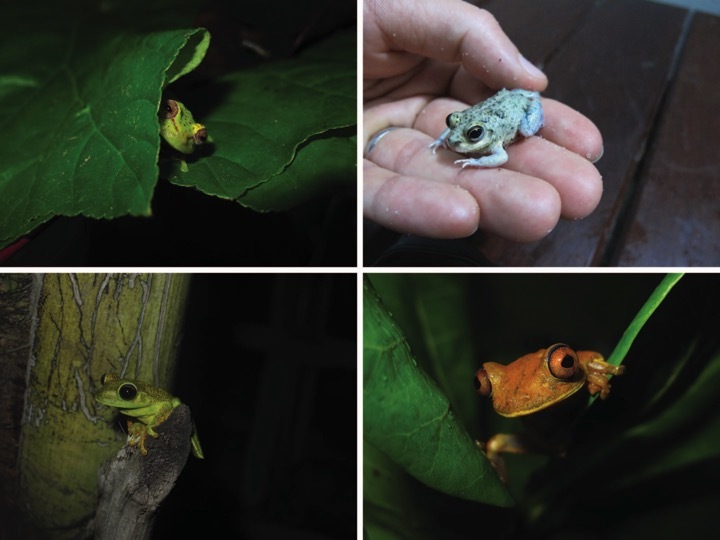 Our team alternated between visiting patches of forest and patches of cabruca each night, capturing as many frogs as we could and swabbing all of them in the same night before releasing them. Three of the focal species that we sampled at Serra Bonita. 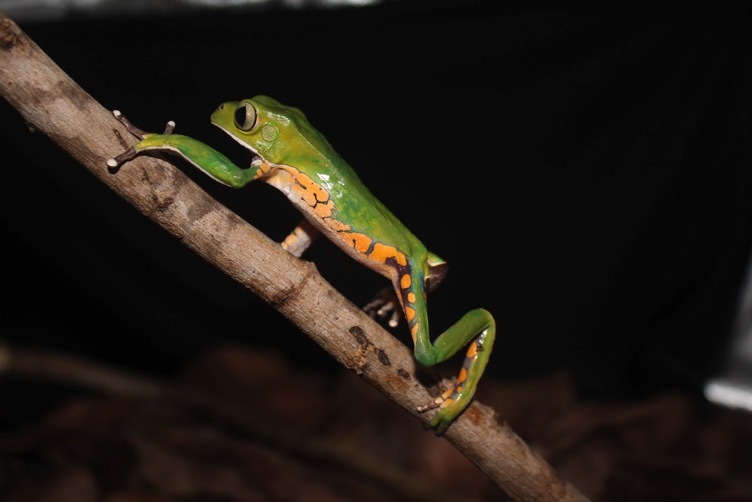 Top: Pithecopus rohdei (Rohde’s leaf frog). Middle: Rhinella crucifer (striped toad). Bottom: Dendropsophus elegans (elegant forest treefrog). Next, we traveled to a different forest reserve, the Michelin Reserve. The Michelin Reserve is located about two hours north of our homebase of Ilhéus, Bahia. At first I thought the resemblance between the name of the reserve and the tires on my car was a coincidence, but soon I learned that the French rubber company did in fact own the reserve. On the Michelin reserve are a number of cerigueras, or rubber tree plantations. Rubber trees are very tall and skinny, and in many of the rubber groves there is cacao planted beneath (presumably to maximize commercial output from the land). Between these rubber groves are patches of pristine forests, with some being obviously very old (huge trees!). To offset the use of Brazilian land for rubber production, Michelin maintains and protects a number of large patches of high quality forest, which is inhabited by a surprisingly high diversity of animals. We captured the most frogs out of all of the sites at the Michelin Reserve, as well as the highest diversity of frogs. 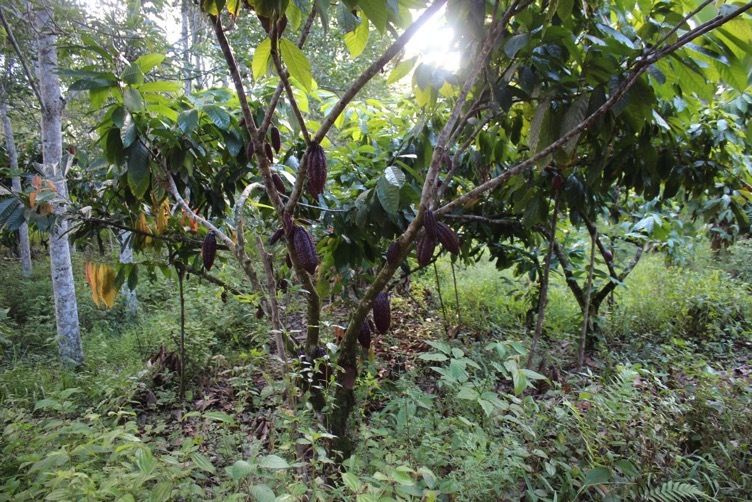 Cabruca-style cacao planted among tall skinny (white-trunked) rubber trees in the Michelin Reserve. This rubber/cacao grove was covered with tiny bromeliads and was beautiful in the pinkish purple light of dusk. Finding a juvenile Aparasphenodon brunoi (Bruno’s cask-headed frog) in a forest patch at Michelin was a real treat. This was only the second individual of this species on record for the Michelin Reserve. 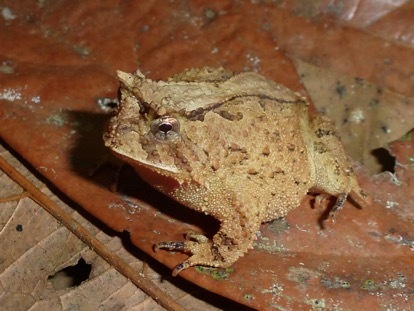 Adults generally exhibit muted dark gray-brown coloration with dark brown eyes but have impressively large, bone-plated heads (which is where the common name of “cask-headed frog” derives). Very young individuals, on the other hand, exhibit striking silver patterns on the back and have bright red eyes, but they lack the characteristic bony head plates. This individual was a “teenager” and possessed the best attributes of both life stages. 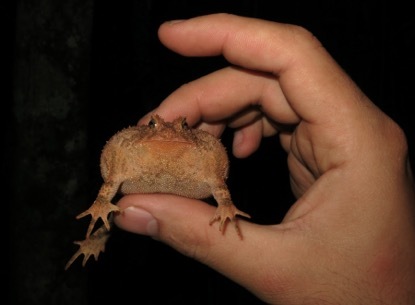 To make the discovery of this frog even more exciting, this is one of the only venomous frogs known to science, and can produce venom that is 25x more potent than that of pitvipers. 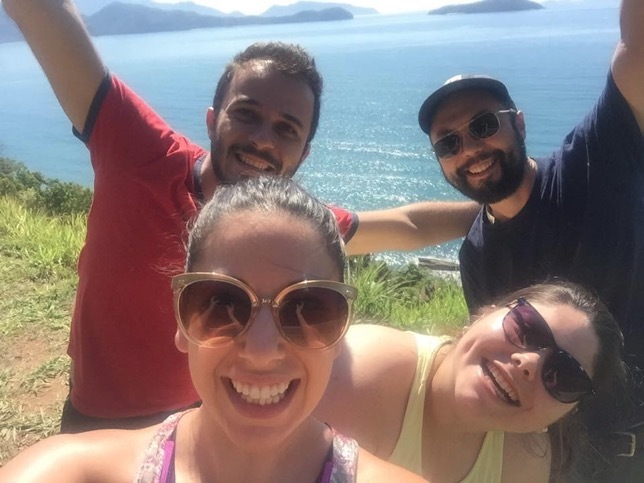 One iteration of my Bahia research team taking a break from the drive back to Ilhéus to enjoy a beautiful view of the ocean. From left to right: Joice Ruggeri, me (Anat Belasen), Rafael “Hobbit” Benetti, and Renato Martins. After our first stay in Michelin, we returned to Camacan to sample fragmented areas surrounding the Serra Bonita Reserve. We talked with a number of farmers to be sure it was alright to sample on their land, and then returned at night to follow the sounds of calling frogs until we hit the jackpot. Some of these fragmented sites host huge densities of frogs, but mainly species that are able to exploit lower quality habitat. It could be that fragmentation filters out species that can be strong competitors in a mixed community, but are more sensitive to abiotic factors that change with fragmentation. Therefore the species that remain would experience competitive release and attain "unnaturally" high densities. A large Phyllomedusa bahiana (the Bahian leaf frog) found in a patch of cabruca in Camacan, just outside of the Serra Bonita reserve. I’m fairly certain this is the largest tree frog I have ever captured - its SVL (length of the body, including the head, not including the legs) had to be close to 4 inches. Finally, we returned to the Michelin Reserve to complete our sampling within reserve as well as sample the fragments surrounding the reserve. The forest fragments in Igrapiuna were bigger compared with Camacan. This is probably why we were able to find more sensitive, leaf-litter dwelling species like Physalaemus signifer and Haddadus binotatus. A big (~½”) female Physalaemus signifer (Girard’s dwarf frog) found in a forest fragment in Igrapiuna, just outside of the Michelin Reserve. With over 800 swabs collected and genetic samples from over half of the frogs we swabbed, it was time to go back to Michigan and hunker down in the lab (with lots of help from my two wonderful research assistants, of course!). It’s now up to me to get as much information out of these samples as possible. 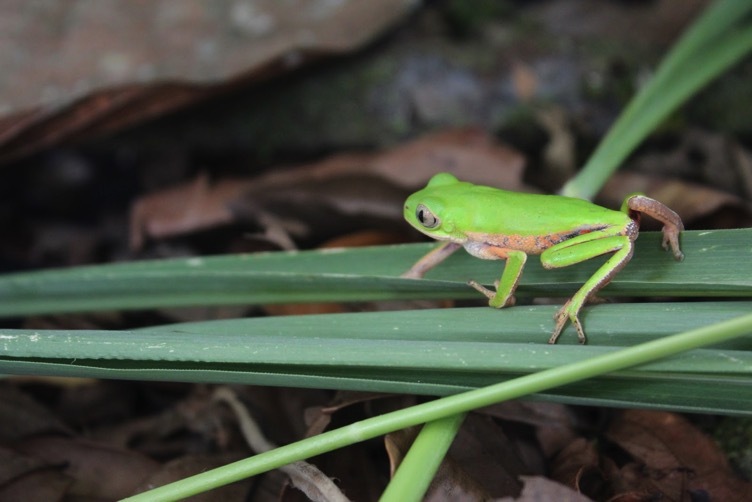 The hope is that these data will give us some idea of the effects of different farming practices on frogs and their disease susceptibility, to inform conservation efforts of these sensitive and diverse animals. The Brazilian Atlantic Forest chytridiomycosis sampling transect is complete! 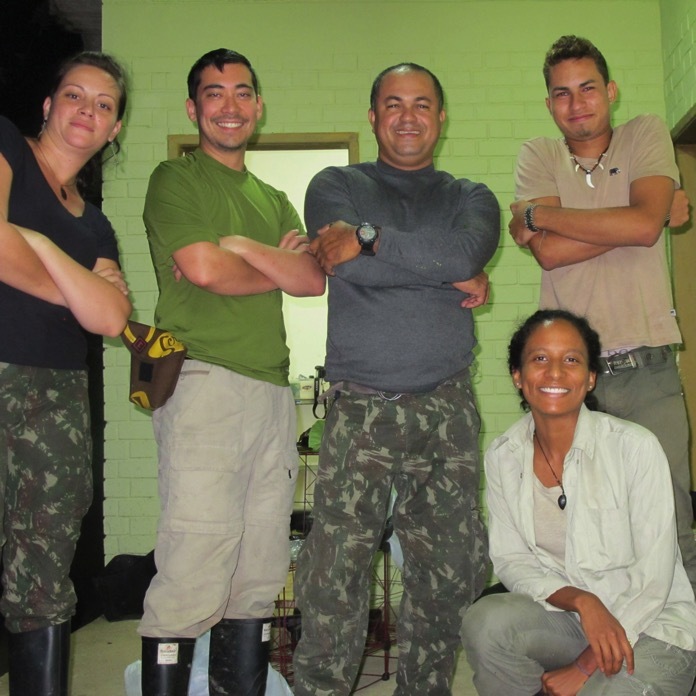 Our collaborative team has finished a full, north-south survey of Bd infection in the Brazilian Atlantic Forest. Over the three years since its inception, our research team has collected and analyzed skin swabs from over 2400 individual amphibians, and isolated over 120 Bd cultures for genetic and phenotypic studies. To complete the last segment of the Atlantic Forest transect in 2015, we sampled the northeastern states of Rio Grande do Norte, Paraiba, Pernambuco, Sergipe, and northern Bahia. This last stretch of the transect was completed in collaboration with Dr. Tamí Mott’s research group from the Federal University of Alagoas (UFAL) and again with our collaborator Dr. Felipe Toledo from the Universidade Estadual de Campinas (UNICAMP). This trip, the team drove over 1000 km across the Nordeste region of Brazil in June of 2015 adding six new sample localities. The Nordeste is a fascinating part of Brazil with a different flora and herpetofauna than we are used to from our time in the southern and southeastern Atlantic Forest states. Here, the Atlantic Forest bioregion forms a mosaic, intermingling with the arid rangelands of the Brazilian Caatinga. It is an area infused with rich Brazilian history replete with lavish stories; from those telling of the folk-hero, frontier bandit Lampião who roamed the dry hinterlands of the region robbing aristocrats to provide charity to poor settlers, to the slave rebellion leader Zumbi dos Palmares of Alagoas who headed Brazil’s largest self-governing colony of escaped African slaves (a quilombo). In addition to boasting the most beautiful beaches in Brazil, the Nordeste is dotted with great historical cities like Salvador, the first colonial capital of Brazil making it both a biologically and culturally captivating part of the country to visit. We started our expedition in the northern beach city of Natal, Rio Grande do Norte where we collected amphibians in one of the northernmost remnant patches of Atlantic Forest habitat, the Mata da Estrela Reserve. After two nights in Rio Grande do Norte, and a few dolphin sightings off the Atlantic shore, we headed to the Mata do Buraquinho Reserve in João Pessoa, Paraíba, and then to the Caetés Reserve just north of the major city of Recife, Pernambuco. 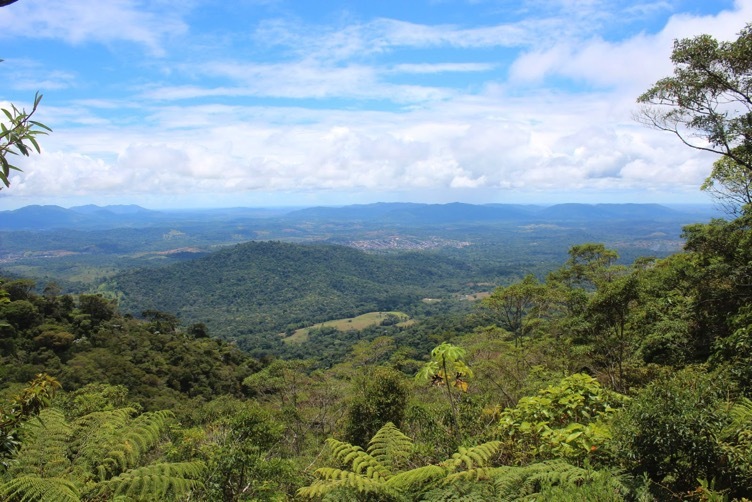 The Caetés Reserve was a particularly interesting because this reserve contained both intact Atlantic Forest habitat as well as restoration areas dedicated to regenerating the forest after the land was reclaimed from human land-use and disturbance. It was in the Caetés Reserve where our team was lucky enough to spot a sloth in the treetops. In addition to the dozens of amphibian species we collected in the reserve, we also got to see some great macrofungi for the mycologists on the team, including a beautiful Cantharellus pictured below. After a quick pit-stop at our northern home base (UFAL) in Maceió, Alagoas to unload field specimens and resupply, we continued heading south, passing by Anyelet and Tami’s high elevation, Muraci sample site. We ended up next at Serra de Itabaiana National Park in the hills northwest of Aracaju, Sergipe, where we were joined by Professor Daniel Mesquita from the Federal University of Paraiba. We spent much of our time collecting amphibians near a central river punctuated with waterfalls and isolated pools, which are great for tadpoles. In the afternoons, while processing specimens we were visited by a playful group of marmoset monkeys curious about our work. Finally, we finished by sampling at our final transect point, Sapiranga Forest Reserve in Bahia just north of the state capital, Salvador. Above. Marmosets visiting the field lab in Serra de Itabaiana National Park (left), and sloth spotted in the Caetés Reserve (right). After three field seasons of intensive sampling, we reflect on the great deal of work the entire team has put into this project, and anticipate what a full analysis of the data will tell us. It is amazing to think that just a few years ago this project was initiated through an NSF/FAPESP Catalyzing New International Collaborations Grant to strengthen research ties between Brazilian and American institutions studying Bd in Brazil. In 2012 the new Bd lineage, Bd-Brazil, had just been discovered along with a hybrid strain between the global pandemic lineage, or Bd-GPL (Schloegel et al. 2012). At the time, however, we did not know the range of Bd-Brazil nor the extent of hybridization between lineages in the Atlantic Forest. Above. Frogs encountered during the trip to the nordeste. In fact, little was known about the scale of Bd infection or how it varied across the Atlantic Forest region. 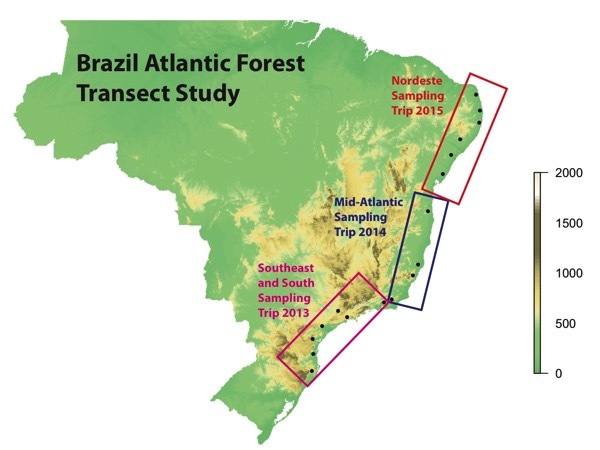 At its inception, project leaders from University of Michigan, the State University of Campinas (UNICAMP), Cornell University, University of Maine, and the Federal University of Alagoas envisioned a comprehensive transect survey across the north-south length of the Atlantic Forest. 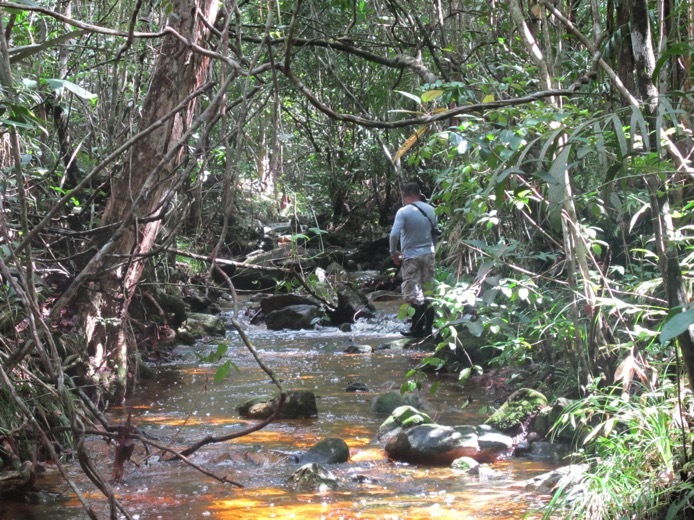 In 2013, our team started the project by sampling the southern portion of the Atlantic Forest closest to São Paulo. 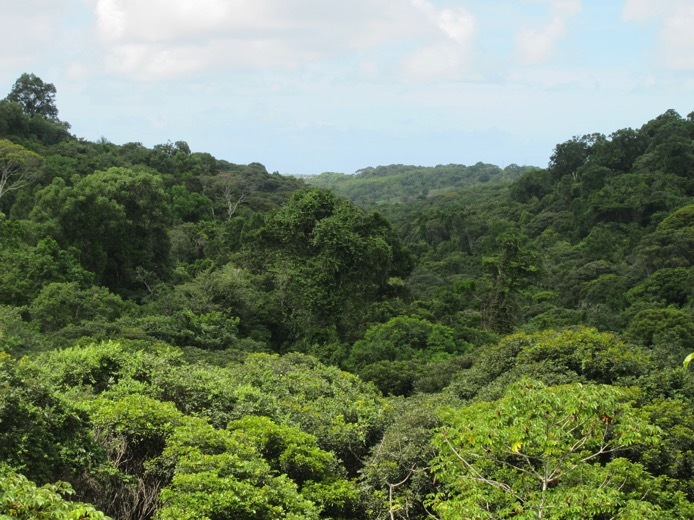 Then in 2014, we moved on to sample the middle section of the forest from Espirito Santo to southern Bahia. With this last segment the transect has grown to over 4000 km, spanning 11 Brazilian states, with intensive sampling from almost 20 collection sites. A survey like this was important for as few reasons. 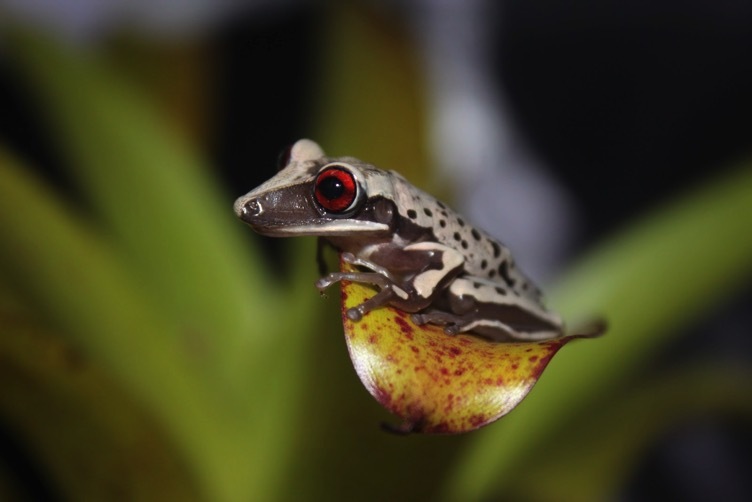 As mentioned before in this blog, the Atlantic Forest is home to a staggering diversity of amphibian species, and their habitat has been increasingly fragmented threatening their existence. Bd in the Atlantic Forest is also important to understand because this is only one of a few global regions which have multiple divergent Bd lineages coexisting within native amphibian communities, and the only hybridizing populations of Bd known in the world. Understanding the infection dynamics of this region will provide insight into how multi-strain interactions shape the epidemiology and evolution of virulence in Bd. A study of these Atlantic Forest lineages could be a valuable opportunity to piece together how these lineages came into contact, and what consequences that contact will have on their ecology. Finally, our team was also very excited to see how well infection patterns across the Atlantic Forest transect matched the latest habitat suitability predictions we recently proposed in James et al. (2015). The initial look at our data from the full transect is already proving to be very interesting. 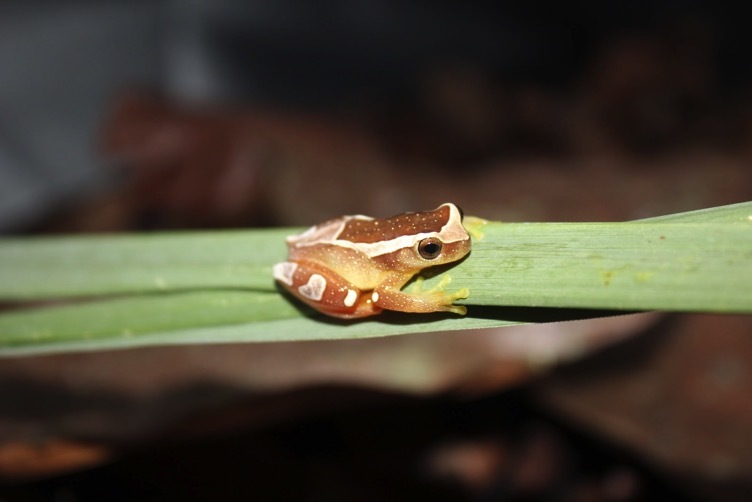 We are beginning to see a broad trend for infection to drop as amphibian populations reside at latitudes closer to the equator, and as predicted in our habitat suitability model, elevation seems to be playing an influential role in promoting infection especially at warmer latitudes. We are still interested to examine how infection varies across the broad range of amphibian species sampled, and to better understand the population genetics of Bd in the Nordeste region. If the invasive, global pandemic strain of Bd has recently expanded across the northern Atlantic Forest as we hypothesize based off of our population genetic analyses using cultures (Jenkinson et al., in press), we should be able to observe a pattern of lowest genetic diversity in the most recently expanded populations. Much remains to be learned from a full analysis of out Atlantic Forest data. We are now working to finish piecing together the Brazilian Bd story, and hope to have more to share with the amphibian disease community about this region soon. Could islands be key in understanding the enigmatic dynamics of Batrachochytrium dendrobatidis? There are a couple of reasons to think so. First, islands present an opportunity to disentangle complex things, like community structure (they tend to be simpler than the mainland, with fewer host species), disease transmission among sub-populations (they’re usually isolated, especially for amphibians), and anthropogenic disease introductions (again, they’re usually isolated… though not always). Second, because islands, especially small ones, contain small isolated populations, these populations tend to be genetically impoverished because of the combined actions of genetic drift and inbreeding. The presence of these conditions offer a chance to look at how host genetics can mediate disease dynamics. Third, since they’re so isolated, islands might be disease-free! This could be really useful and exciting, especially since Bd seems to be everywhere, limiting our ability to compare control (disease-free) populations to those suffering epidemic declines. This comparison could allow us to identify factors responsible for resistance, and help us understand the hosts’ evolutionary responses to disease. With these three reasons in mind, our team took to the land-bridge islands off of the northern coast (Litoral Norte) of São Paulo state, which are essentially 10-20,000 year old fragments of the Brazilian Atlantic Rainforest, separated by Quaternary sea level rise following the Last Glacial Maximum. 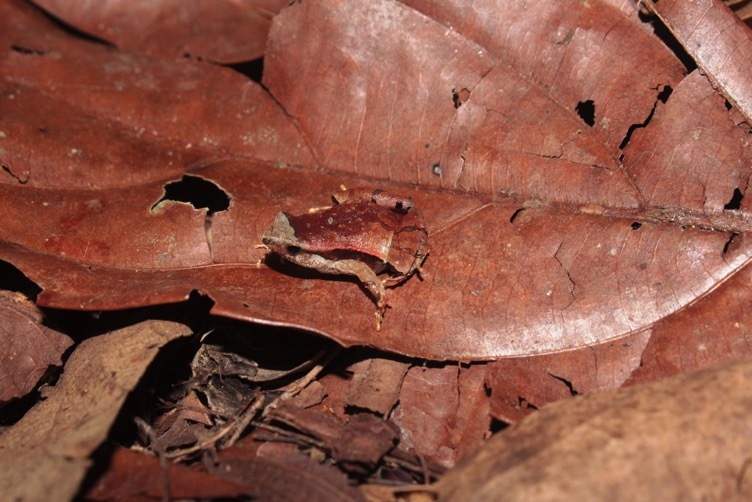 We focused on one species, Thoropa taophora, a Cycloramphid frog that is found on a large proportion of these islands. This species is able to reproduce on rocks covered in a small film of water, making it resilient against harsh island environments, which are more variable and can dry out faster than the mainland. Few pool-breeding species are found on the islands, likely due to this increased level of exposure to the elements. We also sampled every other frog encountered, to maintain a record of the background disease pressure faced by these populations. Right. Two Thoropa taophora congregating on the wet rocks at the Praia do Toque-Toque Grande, SP. Above. These Thoropa tadpoles undergo complete development to metamorphosis on the wet rock surfaces. 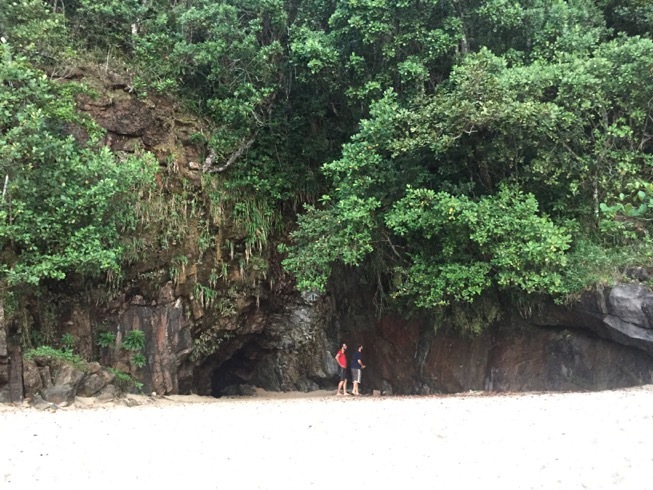 Seven island populations of Thoropa were surveyed, and both skin swab and genetic samples were taken for future analyses. 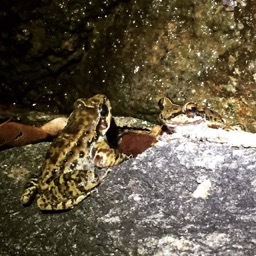 Genetic samples from frogs will allow the analysis of population genetics, to see how impoverished these island populations have become over time. Skin swabs can be used to screen for a number of pathogens, including Bd, Ranaviruses, and other fungi and parasites that can infect amphibians. These data can be used to examine whether populations with lower genetic diversity exhibit higher overall disease susceptibility in the field, and also to test the hypothesis that pathogen communities can also become less complex as hosts lose genetic diversity or as the pathogen community suffers island effects as well. This may be problematic, because lower parasite diversity could release competitive control on more dangerous pathogens like Bd. Above. Felipe Toledo on the way to Mar Virado. We also surveyed mainland populations to serve as baseline sites, to see what level of genetic diversity T. taophora “normally” harbors. The mainland sites included rocky beaches and sandy caves along the northern São Paulo coast. This fieldwork was pretty different from last year, when we spent most of our time in remote forests. This year we interacted with local people (beachgoers) a bit more. They were often interested in what we were doing, and sometimes they even helped us catch frogs on the beach. Above. Tsunami and Tim at the Gruta que Chora (Crying Cave) at Sununga Beach. Above. 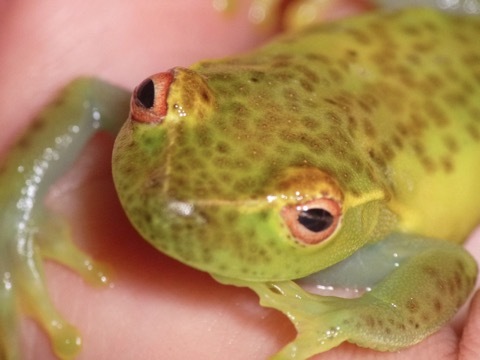 Citizen scientists help catch frogs. Land-use practices that degrade and fragment habitats cause wildlife populations to become reduced and isolated, much like species living on islands. Through the same processes of genetic drift and inbreeding, these fragmented populations lose genetic diversity. 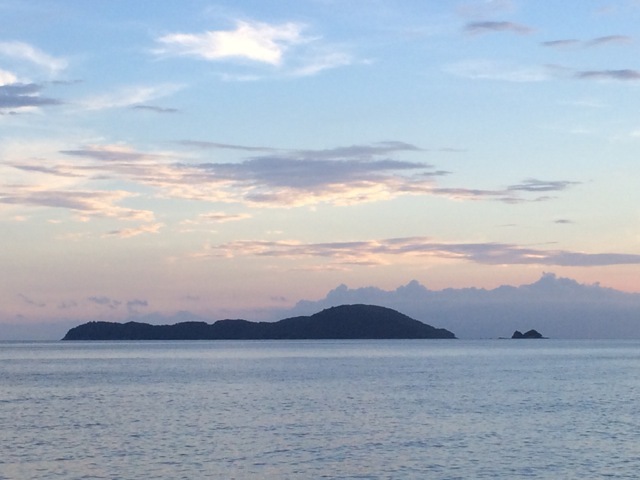 Therefore, a fourth reason to study islands is because they provide us with insights into the effects of the long-term loss of genetic diversity. Therefore, land-bridge island systems may help us understand what current habitat fragmentation may be doing to wildlife in the long run. Now that the samples are collected, the real work begins to piece together the puzzles of disease distribution, genetic diversity, and susceptibility in island frogs of the Brazilian Atlantic Forest. 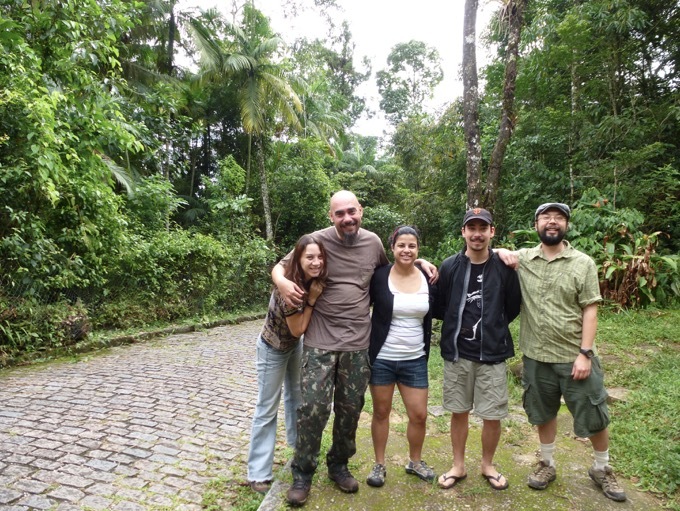 The Bd in Brazil crew is back again this year, this time moving the transect north into the states Espirito Santo and Bahia of the Atlantic Forest. We are a team of mycologists and herpetologists interested in understanding the biology of a fungus disease that globally is decimating amphibian populations (Wake and Vredenburg 2008). 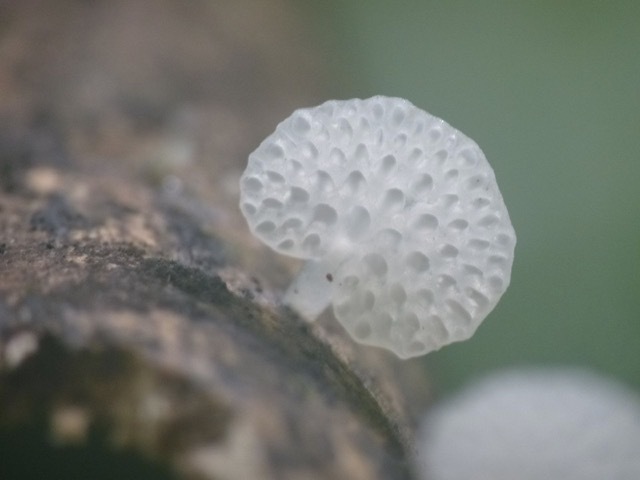 The ultimate goal of the Brazilian research is to sample across the remaining fragments of the Brazilian Atlantic Forest from Rio Grande do Norte to Rio Grande do Sul for molecular epidemiological studies of the fungus. 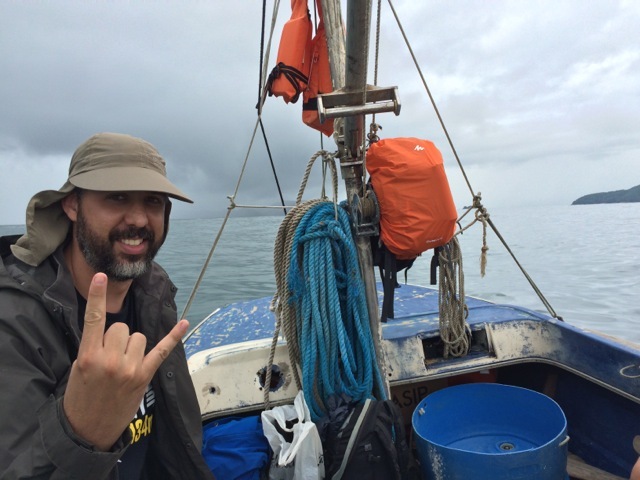 This year’s crew is again a combination of researchers at UNICAMP (Felipe Toledo Lab, Campinas, Brasil) and University of Michigan (Tim James Lab) and Cornell University (Kelly Zamudio Lab). 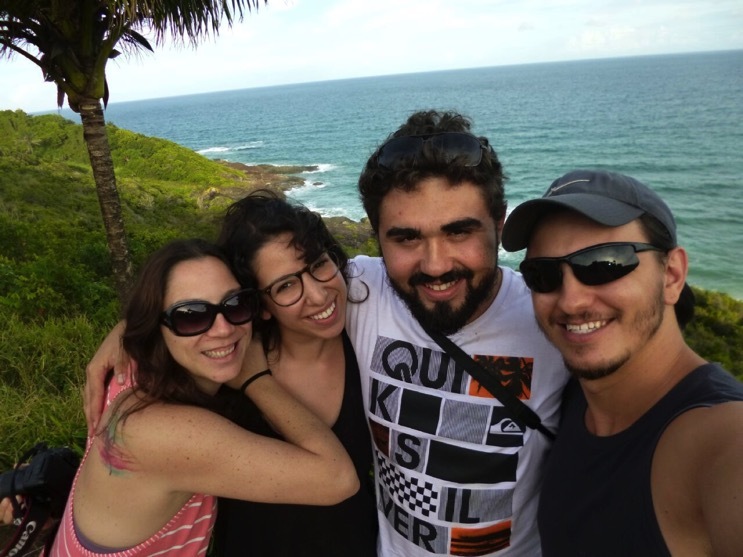 We also had the pleasure of adding a member from UFAL (Universidade Federal de Alagoas), Anyelet Valencia from Tamí Mott’s lab. In brief, we found Bd at 4/5 sites in tadpoles, with prevalence ranging from very high (50%) to very low (1%) on the basis of morphological examination of tadpoles. The three sites with high levels of Bd were all high elevation (>600 m) localities, whereas the lowland rainforest showed a near absence of Bd in tadpoles. It will be of great interest to compare the results we have on Bd prevalence from the larval data to that of the adults. At each of the 5 localities, over 100 adults were swabbed and analysis of Bd infection by qPCR is in process at UNICAMP. At one locality near Pedra Azul, we collected a second year North American bullfrog tadpole, infected with Bd, in among a diverse pool of native tadpoles, some also infected. A couple tadpoles from the pond near Pedra Azul, Espirito Santo. What is becoming abundantly clear is that there is a strong correlation with detectable Bd infection of larvae and temperature of the water from which they are collected. 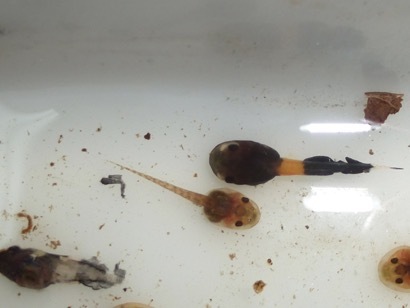 Cool streams running down from high elevation sites seem to invariably yield infected tadpoles, whereas warm unshaded ponds as found in deforested sites with daily maximum temperature above 25 have all uninfected larvae. Of course this fits in very well with what we know about the tolerance of Bd in the laboratory. That is, growth is essentially halted when Bd experiences temperatures at or above 28 C (Piotrowski et al. 2004). On the other hand, adults collected from the same warm ponds can be quite infected with Bd. 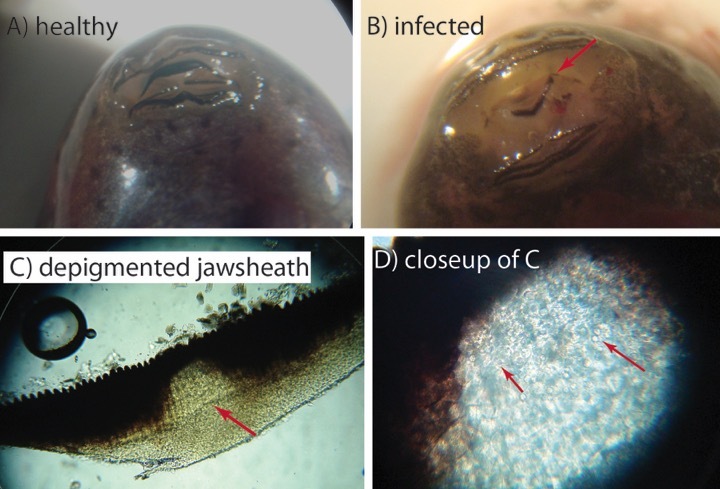 These observations of differential infection of adults and larvae prompt at least a couple questions regarding the disease dynamics. Firstly, how do the adults become infected in the first place? Where is Bd lurking among the places to which adults might journey? Are adults acquiring their infections by crossing these Bd-infested streams or is there another refuge for the fungus in these warmer sites? Secondly, what effect does this high level of Bd infection in tadpoles have on the adults of riparian species of frogs? Are there sub-lethal effects or mortalities that have gone undetected. 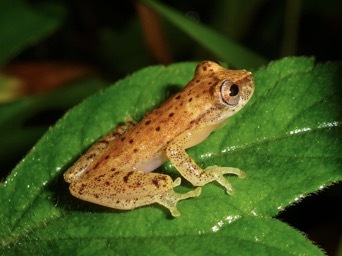 Dendropsophus branneri from southern Bahia. These frogs breed in permanent and vernal pools and live in a variety of habitats except closed canopy forest. Bd infection status is unknown at present. The answer to this second question is critical to our understanding of the impacts of Bd on Brazilian amphibians. While the consensus, or absence of evidence, points to no known Bd-related declines in the Atlantic Forest of Brazil, it is a statement which largely speaks to poor data. Also, Bd could also have large impacts on population density without obvious extinctions and observed die offs. As it stands, it is an interesting correlation that the 31 species suspected of undergoing declines are enriched in those who inhabit high elevation riparian sites (Eterovick et al. 2005). Our crew has now visited a couple sites where declines are reported (PARNASO, Teresopolis, RJ and Santa Teresa, ES) and these two localities are sites where Bd occurs at high prevalence. Our sampling has now expanded over a large portion of the Atlantic Forest and has sadly extended the known distribution of Bd into additional states, Bahia and Espirto Santo. 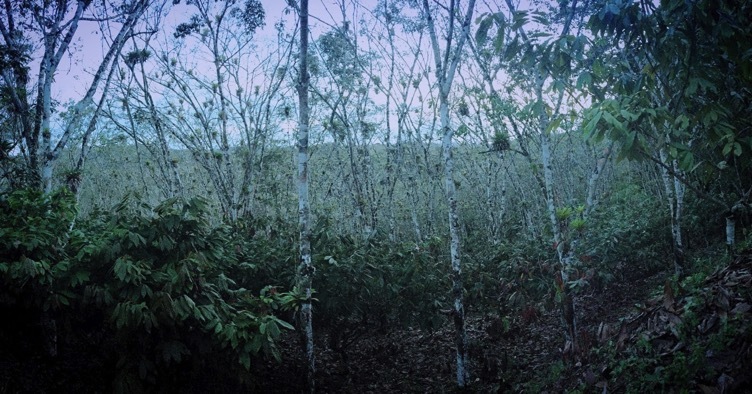 The once continuous Atlantic Coastal Forest of Brazil appears to have Bd wherever conditions are favorable for the fungus. Interestingly, there appears to be a negative correlation between Bd prevalence and degree of forest fragmentation (Becker and Zamudio, 2011). This paradox has been explained in a couple ways, either the degraded habitat selects for weedy species of frogs that thrive in disturbed areas, and there may be a correlation between aggressive weedy species and resistance to Bd, or the reduction in diversity may reduce the equilibrium infection frequency of Bd in a community. Alternatively the increased fragmentation leads to increased solar radiation and thus higher temperatures, making water and terrestrial habitats perhaps less favorable to Bd. Map of the distribution of Bd in Brazil as known in 2012 (Fig 7 of Schloegel et al. 2012). Despite the observation that Bd may occur in lower frequencies in deforested sites, stopping or reversing deforestation in Brazil should be a central priority of conservation biologists working here. Though not based on any specific data or experiments, my impression is that the the Atlantic Forest and its biodiversity could rebound if the deforestated areas are allowed to recover, a change in land use policies is implemented, and enough time elapses. While settlement contributes a large proportion to the loss of forest, obvious are also the hectares infinitos devoted to raising cattle, growing eucalyptus, sugarcane, coffee, soy, bananas, and etc. With a Brazilian economy emerging rapidly, including a burgeoning middle class with US sized consumerism, it will require progressive leadership to value future resources over money in pockets. Nevertheless, the people are concentrated into urban environments, with a rural landscape that is deforested primarily for agriculture or logging. When I look at this fragmented landscape, I see potential for regrowth of the forest, for the salvation of the wildlife and plant species and their diversity. What is left must be protected at all costs because extinctions are much more likely given small fragment sizes and invasive species. What has been razed for cattle and sugarcane must be allowed to grow back by a few centuries of abandon. I remain hopeful. Back to our research. Brazil is known to harbor three genotypes of Bd: Bd-GPL (a global genotype associated with all known Bd related declines), Bd-Brazil (a genotype known only from Brazil and possibly Japan with unknown virulence), and Bd-Hybrid (sexual genotypes produced between Bd-GPL and Bd-Brazil). We are attempting to use our cultures of Bd to understand how temporal and spatial patterns of genotypes can answer the question of what and when Bd came to Brazil. We predicted last year that Teresopolis, where declines are recorded, would have the hyper virulent Bd-GPL genotype, and that held true (in prep). We predict the same for Santa Teresa, ES, where species like Colostethus olfersioides are in decline (Weygoldt 1989; Stud. Neotrop. Fauna Environ. 243: 249). As part of the same hypothesis we predicted that Bd-Brazil was endemic, perhaps extending deep into the time when there were multiple, isolated refugia for fauna during Pleistocene global cooling and drying events. Maybe there are more genotypes of Bd in the Atlantic Forest that have yet to be recovered centered around these refugia. In frogs at least, there are known to be three refugia in the AF relating to concentrated forest fragments (Carnaval et al. 2009). Maybe the presence of these endemic genotypes has provided some sort of defense against Bd-GPL, some sort of immunization or competition among the global hyper virulent lineage? Currently, we have found Bd-GPL at every site we have sampled, but Bd-Brazil only at sites in Paraná, Santa Catarina, and São Paulo. This would seem to be consistent with a model of Bd-GPL recently replacing Bd-Brazil, perhaps through their introduction on bullfrogs, which arrived in Brazil in the 1930’s. However, this hypothesis is challenged by the recent observation that both Bd-Brazil and Bd-GPL genotypes have been detected from museum specimens dating back to at least 1916 (Rodriguez et al. 2014). Bd has apparently been in the Atlantic Forest since 1894. Proceratophrys schirchi. These Leptodactylids are able to defend themselves from predation by inflation. Photos: T. James (Top), K. R. Zamudio (bottom). Getting to the bottom of the genotype mystery will require integrated studies of museum collections, population genetics, and infection experiments. Detecting population expansion could use coalescent methods in population genetics, but a general lack of variation and polyploidy has been a big hindrance. We are currently developing new markers to ask the question of whether the Bd-Brazil or the Bd-GPL strains have greater heterozygosity in the AF. That seems to have been the case based on genome resequencing (Rosenblum et al. 2013), but many more isolates need to be tested. I dream of establishing long term monitoring plots in the area we know that all three genotypes occur so that the dynamics of the genotypes in time and space can be studied properly. Feb. 3, 2013. 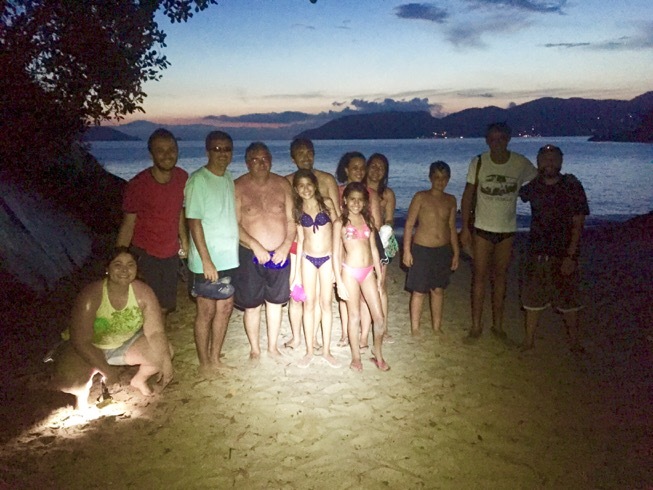 We&apos;ve recently returned from a trip east to a national park called Serra dos Órgãos (PARNASO) in the state of Rio de Janeiro. 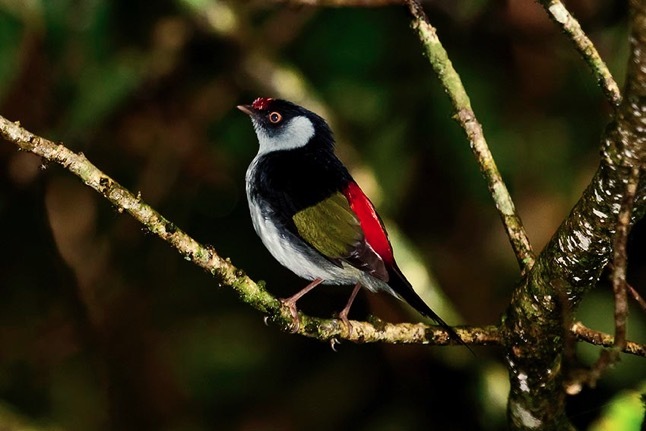 This region of Brazil is particularly interesting because it is a place where a few endemic species have declined in recent times (Silvano and Segalla 2005), including the species Thoropa petropolitana. Whether or not chytridiomycosis is involved in the declines is something we hope to address with our research. Many things about PARNASO seem like a good place for Bd: it is a cloud forest, extremely wet with many streams, pools and rivers, cool temperatures, and proximity to a major metro area, the town of Teresópolis. Amphibian diversity is high here, including about 100 species, with some species like T. petropolitana and Aplastodiscus musicus only known from this location. If there are chytridiomycosis related declines in Brazilian Atlantic Forest then this might be the place. Could all the environmental conditions be met such that chytrid can actually lead to species decline and even extinctions here unlike other parts of the AF where no disease related declines are known? And is this region a bubbling breeding ground for the formation of virulent strains of Bd that have been dispersed to parts far and wide and have caused havoc in other parts of the world. Is this the heart of the global chytridiomycosis epidemic? Aplastodiscus is found in PARNASO in epiphytic bromeliads. This leads me back to the discussion of whole reason why the Brazilian Atlantic Forest is so important for chytridiomycosis research. First, the biodiversity and endemism of the region is phenomenal, yet horribly threatened by anthropogenic disturbance. Second, the region has many threatened species and many species for which data are inadequate (see note by Pimenta et al. 2005), but those declines and disappearances are suspected of being due to habit destruction with no known role for chytrid. 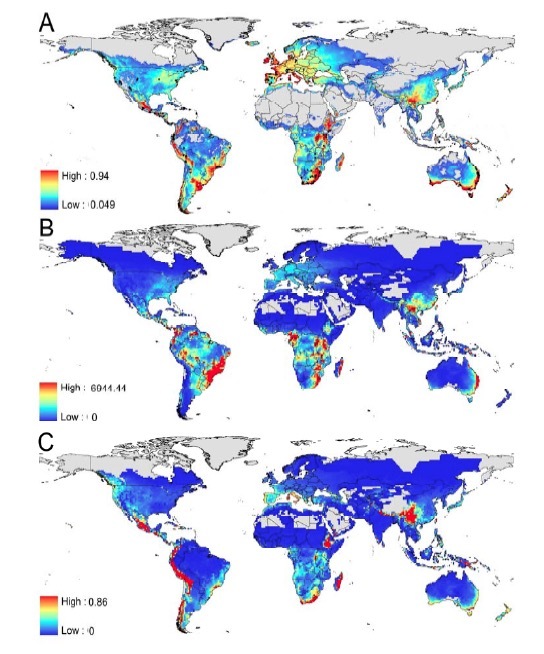 Yet, when you look at the models that attempt to predict the distribution of chytrid based on existing data and climate/species variables, they strongly suggest that chytridiomycosis should be very prevalent throughout the AF, with some non-negligible risk of decline or distinction centered around Rio de Janeiro (see Figure C below from Rödder et al.2009, Diversity 1:52). These models are entirely consistent with the existing publications showing chytrid to be widespread in the AF (Carnaval et al. 2006, EcoHealth 3:41; Toledo et al. 2006, South American Journal of Herpetology 1:185) and our own observations from this trip. Yet based on the analysis of Bielby et al. (2008, Con. Letters 1: 82), many of the life history characteristics of species declining due to Bd in other geographic regions are not observed in the AF. The details of this analysis regarding amphibians of the AF are a little curious to me, as Bielby et al. identified high altitude, low fecundity, and aquatic life history traits as factors associated with risk of species displaying Bd-associated declines, and all of these characterize at least parts of the AF herpetofauna. Something also is a bit imperfect in the models as Panama doesn&apos;t show a smoking signal in the models, yet it is the most notorious region of Bd declines. Figure 2 of Rödder et al. 2009. A). Species Distribution Model showing the potential distribution of Bd based on existing occurrence data and climate variables. B). Overlap of the potential Bd distribution and amphibian diversity shows the Brazilian Atlantic Forest to have the huge potential for species declines and possibly Bd diversity. C). 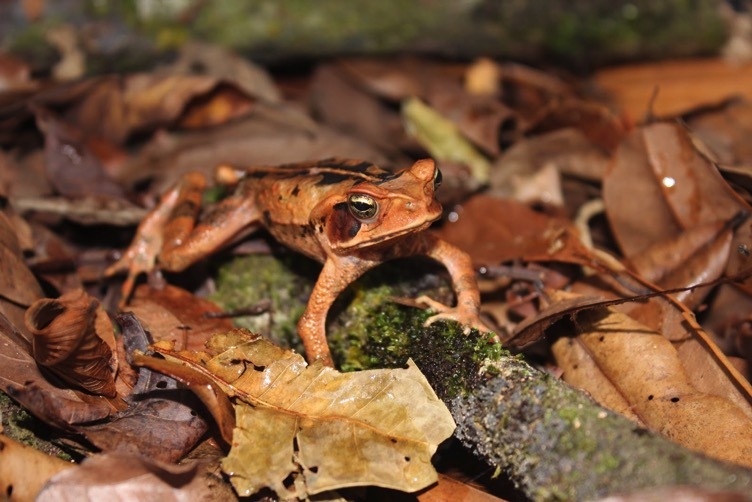 However, Risk Factor analysis suggests that by overlaying potential Bd distribution and life history traits of the animals, the Atlantic Forest amphibians are not nearly in as much jeopardy as Andean frogs. Just as expected, we found evidence for Bd in PARNASO on from infected tadpoles collected from streams. We also swabbed exactly 100 adults for later molecular diagnostic tests for Bd that will be done at UNICAMP. 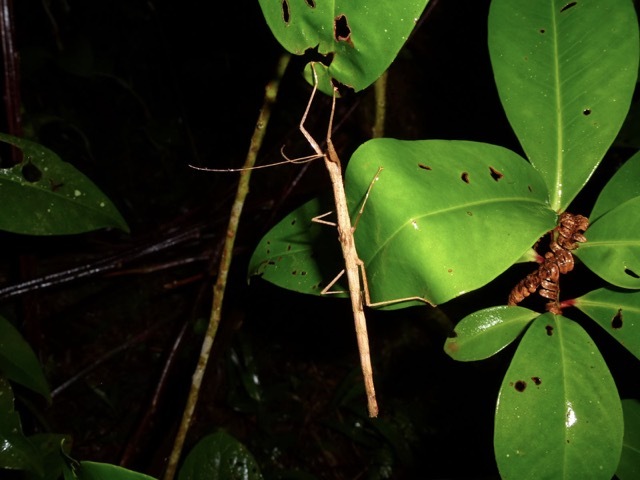 Adults were a bit hard to find, which our local expert, Joice Ruggeri, suggested was due to the incessant rain rather than chytridiomycosis, based on her experiences at PARNASO. We are currently working on isolation of the pathogen from the tadpoles and are ultimately very interested in determining the genotypes of the Bd strains. Our hypothesis is that PARNASO may show an epidemic population structure with a single genotype of the hyper-virulent Bd-GPL group. I wanted to share some excellent photos that Clarisse Betancourt-Roman took of the infected tadpole mouthparts. These poor tads can get so infected by Bd, that their foraging behavior is significantly reduced (Venesky et al. 2009). Figure A) the upper jawsheath is clear and black across, whereas in B) most of the pigment of the upper jawsheath (red arrow) is missing. C) another jawsheath shows a large region of depigmentation in the center (arrow). D). Under higher magnification, numerous spheroid Bd sporangia can be seen. credit (Clarisse Betancourt-Roman). 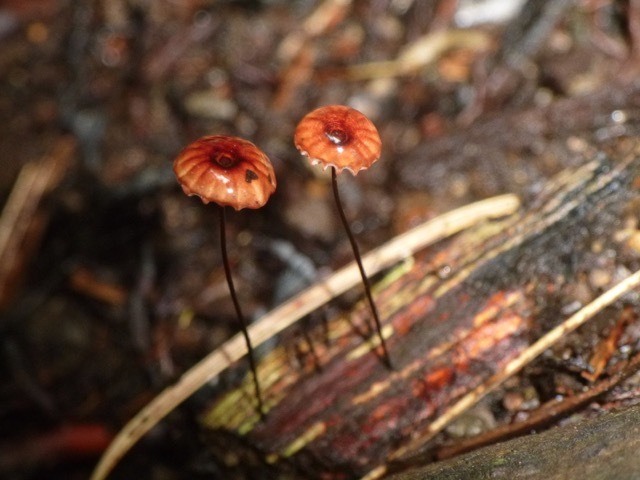 PARNASO also has tons of amazing wildlife, plants, and fungi. Brachycephalus ephippium (sapinho-pingo-de-ouro or pumpkin toadlet). B. ephippium moves very slowly but it can afford to because its color is a warning that it is highly poisonous. However, it can also leap when needed and does an odd karate kid style move when threatened by other males. These last two pictures were taken by Carlos Henrique who is a graduate student with Felipe Toledo and also an amazing birder who leads tours in southern Brazil (http://www.carduelis.bio.br/).